My Little Pony is a franchise that began with toys, and it got animated series to help market them. Eventually the benchmark "Friendship is Magic" series was produced by Lauren Faust (creator of the Powerpuff Girls) where they were drawn with much more angular anime-type artstyle (much like Teen Titans). Eventually it entered the universe of manga when a Japanese comic was created of it. 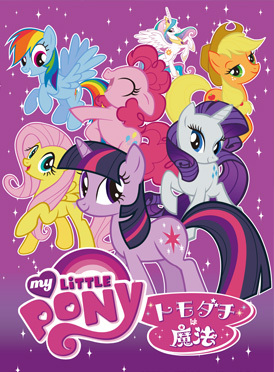 According to AnimeNewsNetwork, Pucchigumi magazine, published in Japan by Shogakukan, is to include My Little Pony. Manga is to be printed in this magazine. The anime Little Pony TV was a short live-action segment inserted before closing credits in the Japanese version of My Little Pony Friendship is Magic. The segment is presented by Suzuko Mimori, who also voices Pinkie Pie and sings the intro theme for the Japanese version. The segment features Mimori and Twilight Sparkle talking, and ends with a segment called "Lucky Pony Slot", which functions like a slot machine, and picks a different pony each episode. US Backcard Story: Lemon Drop saw a strange, muddy pony galloping toward her from across the field. "My goodness, I think you need a bath!" she exclaimed as she poured her favorite bubble bath into the waterfall beside the stable. Soon bubbles were everywhere, twinkling in the sun and floating on the gentle breeze. "Perhaps I put in too much bubble bath," she thought. "Oh well, she really is very muddy." After much scrubbing a beautiful, yellow pony emerged from the bubbly water. "I'll call you Bubbles," said Lemon Drop. Bubbles just smiled. She had found a new friend. UK Backcard Story: Bubbles is a shy pony who loves to play in the muddy field and roll about covering herself in goo. But bath time is also a favourite time as she chases bubbles on the wind. She was a popular character in the UK My Little Pony comics, and could usually be found rolling in a muddy puddle... or spending hours at the Waterfall bathing afterwards! Pretty 'n Pearly - they swim all day. And little Beachcomber all love to play. I love you with me when I take a bath. So cute to look at and make me laugh. To take my bath with her again. sea ponies each sold separately...from Hasbro! I want them all with me! and I'm so glad they're mine! who are in my family. Little Pony Sprinkles. From Hasbro. Features Sealight and Wavedancer on it. Backcard Stories: GARDENIA GLOW's favourite thing in the whole world is a nice warm bubble bath...it's so relaxing! There's just one thing though - she hasn't found a way to keep her book dry when she drops it in the water! Cheerilee Pony is primping and pampering herself at this pony-sized salon and spa playset! Sit her in the hairdresser's chair and give her a spin! Change hairstyles in a snap with five different interchangeable "wigs"! There are plenty of funky shoes and skirts to complete the look. Give your pony pal a relaxing "bath" and a pampering good time in this stylin' salon and spa hangout! Backcard Stories: Precious loves taking a bath and wearing her romantic shower cap on her beautiful long mane. Precious has several accessories for her bathroom: Play with her and have a party with her My Little Pony friends! "Little RAINBOW DASH loves to look pretty. She shows off her brightly colored outfits when playing with her friends. Your cute and cuddly RAINBOW DASH pony figure wants to stay clean and cozy just like you — so take her right along into the bath with you! Take off her “diaper” so it stays dry and then entertain her with her happy-faced little ducky accessory. When bath time is over, pat her with her own little towel and snuggle up close with her when she’s all dry! Name is a play on "Soak" and "Okey Dokey". Called Bubble Bath Time, hair changes color in water. Sprinkles the Pegasus and her sidekick Duck Soup: One day when Sprinkles the Pegasus was flying up along the clouds, she discovered a waterfall. Under it was a beautiful pond, nestled among the clouds. Sprinkles flew down and began to splash and frolic in the water! She was having so much fun washing her mane and tail in the soap bubbles that she didn't notice someone else was there, too. "Hi," quacked a voice. "My name's Duck Soup!" With a quick shake of her tail feathers, the duck waddled over to greet Sprinkles! Sprinkles knew right away that Duck Soup liked ponds as much as she did. They took a bubble bath together and soon became the best of friends. Our Pony's Personality: Sprinkles enjoys taking long, luxurious bubble baths under the waterfall as well as flying over the rainbow in search of an adventure! She loves to play in the water and is learning how to dive. (Right now she's working on a back flip.) She often shows off her latest dive for the others when they are bathing in the pond. UK Fact File Story: Sprinkles enjoys taking long, luxurious bubble baths under the waterfall with Duck Soup, her best friend. She loves flying over the rainbow in search of adventure as well as playing in the water. Sprinkles often shows off her diving to the others when they are bathing in the pond. G1 Sweet Suds' US Backcard: US Backcard Story: "It's bath time!" Sweet Suds called to the Newborn Ponies as she filled the tub. Reluctantly, the little ponies scampered in. "We'd rather make mud pies and jump in the leaves," they sighed through dirty faces. Sweet Suds smiled and poured her special bubble bath into the water. Suddenly, the bubbles began to pop, changing into big, colorful balloons that danced around the tub! "This is more fun than a circus!" the newborns laughed, asking Sweet Suds if they could stay in the tub a little while longer! "Bubble Bath Time with Sweetsong" Backcard Story: There's nothing SWEETSONG likes more then a nice warm bath. She used to read her favourite books in the tub, but they always fell in the water - so now she just plays with her favourite bath toys! G1 Truly's US Backcard US Backcard Story: "It's time for a bath, baby ponies!" Mama Gusty called. But the babies were having too much fun rolling in the grass and jumping in the mud to stop. Truly heard Mama Gusty's call and knew exactly what to do. She filled the Waterfall with bubble bath until heart-shaped bubbles floated over to where the babies were playing. Each bubble gently dipped down around a baby pony and carried her over to the Waterfall. When all the ponies were in the pond, the bubbles flew high up to the sky. One bubble flew so high, it tickled Mr. Sun's nose! The babies splashed with delight. "This is so much fun," they shouted. Truly winked at Mama Gusty as she galloped off, popping soap bubbles along the way. source Patch takes a Shower in a bathtub. Clover takes a Bubble Bath while singing to herself. A bubble bath set that comes with Rarity, Twilight, Applejack, Pinkie Pie, and Fluttershy. It also includes a clip that you can alternate between the 5 ponies. In this German comic published by the Panini company (translated as "Apple Bloom's Big Adventure"), the three fillies go to the lake and subsequently try riding a banana boat towed by four Pegasus ponies. Afterward, the Crusaders get muddy, and the comic ends with the three of them taking a bath together as Applejack, Rarity, and Twilight Sparkle watch. Rarity gets dirty and stung by bees, and prepares to bathe at the half of this issue. At the end of the issue, Celestia bathes while reading a Friendship Report. Twilight Sparkle: Not to worry, I'll just move some of this one to... hmm... I think I may have scooped too much... oops! Now those two have more. Let's just try this again... Hmm, no, that won't do. Let me just... hmm... put some here, and... no, that's not right. A little more on this one, a little bit... and wait... I'll just... ooh, a little bit here, and here, and... perfect! Twilight Sparkle: Okay, time to tackle the next item on our-- oops! Looks like we're going to have to add 'give a baby dragon a bath' to our list. Very efficient! And a little bit gross. Spike: Looks like that's everything! Spike however, gives himself a Tongue bath, cleaning the food off himself. Apple Bloom: Lookie here Twilight. That pot of water wasn't for me, it was for all these herbal ingredients. The cure for poison joke is a simple old-natural remedy. You just gotta take a bubble bath! Twilight Sparkle: But I tried to find a cure in all my books and couldn't find anything. What book has this natural remedy? Zecora: Here is the book you see. Sad that you lack it in your library. Twilight Sparkle: Actually, I do have this book, but I didn't look inside because the title was so... Weird. Supernaturals: Natural remedies and cure-alls that are simply super. I...I... I'm so sorry Zecora. I had the answer the whole time, if only I had bothered to look inside. Zecora: [chuckle] Maybe next time you will take a second look, and not judge the cover of the book. Twilight Sparkle: Zecora? Would you be kind enough to mix up another batch of the herbal bath? Zecora: Mix it up I certainly will. Yet I am missing an herb from Ponyville. Apple Bloom: But whenever Zecora comes to town, all the shops are mysteriously closed. Twilight Sparkle: Oh, well... I think we can help you with that. Daisy: Look Rose! How awful! Rose: The wicked enchantress has cursed them all. Lily Valley: The horror, the horror! Twilight Sparkle: Daisy, we need to talk. My friends and I all learned an important lesson this week: Never judge a book by its cover. Someone may look unusual, or funny, or scary. But you have to look past that and learn who they are inside. Real friends don't care what your "cover" is; It's the "contents" of a pony that count. And a good friend, like a good book, is something that will last forever. Your faithful student, Twilight Sparkle. Lotus Blossom: Miss Zecora. I would love to get the recipe for this bath. It's simply luxurious! Pinkie Pie has a closeup when she is bathing. Twilight Sparkle joins her in the bath. The pair are joined by Applejack (orange, far left), Rainbow Dash (blue, left of Pinkie), Rarity (unicorn to Pinkie's right), Fluttershy (left of Twilight) and Apple Bloom (right of Twilight). Lotus only appears briefly in the final scene, asking Zecora for the ingredients of her herbal bath. In "Winter Wrap Up", Spike bathes Twilight Sparkle in a tub of (formerly canned) Tomato juice to neutralize skunk spray after Twilight was trying to help Fluttershy care for her animals. In "Feeling Pinkie Keen", Twilight Sparkle takes a Bubble Bath in a Clawfoot Bathtub which ends up having an alligator in it freaking her out. It turns out to be Gummy, the pet of Pinkie Pie. Pinkie Pie: My ears are flopping! My ears are flopping! Spike: Nyuh! What does that mean?! Pinkie Pie: I'll start a bath for you. Twilight Sparkle: Huh? [chuckles] A bath? This thing keeps on getting more ridiculous by the minute! Pinkie Pie: Sooo, basically, it works like this: I get different, little, niggling feelings and they mean different things. Like when my back is itchy, it means it's my lucky day. And, when my knee gets pinchy, that means something scary's about to happen. Twilight Sparkle: Is your knee pinchy now? Pinkie Pie: No, but my shoulder's achy. That means there's an alligator in the tub. Twilight Sparkle: [scream] How come your knee didn't get pinchy?! That isn't just scary, it's downright dangerous! Pinkie Pie: No it's not, silly! This is my pet alligator, Gummy. He's got no teeth. See? Haha! Twilight Sparkle: Okay, okay... I get it. Rarity: Good heavens, what is that smell? Rarity: Ah, mystery solved. It's your breath. Rarity: Well, since you insist... But I must say the working conditions in here are simply dreadful. Musty and damp, it's going to wreak havoc on my mane. And this air is stifling, suffocating. And when I try to take a deep breath, the stench of all you dogs makes me nauseated. You look and smell like you haven't bathed in weeks. Have you never heard of soap? You could all do with a good round of soap and water. Oh Water, oh water, I'm terribly thirsty. Could I please have some water? 18 March 2011 "Green Isn't Your Color"
Later Rarity is shown bathing with Towel on Head while conversing with Twilight Sparkle. She notable has pruning/wrinkling on her forehoof. Then Pinkie Pie emerges from a bucket of sponges. Rarity: "My hooves are getting positively pruney"
After Rarity finishes bathing, Twilight Sparkle goes on to bathe herself. Fluttershy arrives and converses with Twilight and then Pinkie Pie emerges once again from the sponge container. After Fluttershy resigns and moral lessons are learned, the episode closes showing Fluttershy and Rarity and Twilight all bathing again. In "A Bird in the Hoof" Fluttershy gives a bird bath to Princess Celestia's pet phoenix Philomena. Fluttershy: I know what'll clear up that tickle in your throat. A humidifier. [deep breath] Refreshing. How's that feeling now for you, Philomena? Better? Fluttershy: Scalpel. Surgical tape. Feathers. Fluttershy: Oh, Philomena. I thought it would be easy to nurse you back to health. I've tried everything I know. And look at you. You're worse than ever. In "Owl's Well That Ends Well", Spike comes across Owlowiscious running a shower into a bathtub wearing a Shower Cap. When Spike's looking for a new quill, one of the places he looks is in the shower, where Owlowiscious happens to be bathing. This is likely a reference to the JeanCraigheadGeorge book There's an Owl in the Shower. Spike: [grunts] Anything else I can do for you, most beautiful one? Rarity: [sniff] [whimper] Hmm... perhaps you could take a bath. How do I put this delicately? You smell like a rotten apple core that's been wrapped in moldy hay, and dipped in dragon perspiration. Spike: I'm the one who spilled juice all over Twilight's copy of Magical Mysteries and Practical Potions! Spike: And I'm the one who used up all the hot water in Ponyville yesterday when I took a seven-hour bubble bath! This is brought up later in #Episode 65. In "The Return of Harmony Part 2" (season 2 episode 2), on the way home at the start, Twilight and Applejack are trapped into Forced Bathing on a soapy road by Discord, who transformed it under their feet. They did not see the trap at first because it was initially dark. Discord lit it up after it was too late. Pinky Pie doesn't slip and accidentally bathe though, using it as sort of a skating arena. Twilight: "If we get back to the library, I have a book that I just know can give us a clue. Ah!" Applejack: "Wow, I can see so much better now. Whoa! I meant to do that." Twilight Sparkle: "Wah! Ahh! Whoa! Discord's turned our dirt roads into soap!" Discord: "Beautiful, isn't it? This is the new and improved Ponyville, and these are only my first of changes." Pinkie Pie: "This may look like fun, but it's not." Discord: "Picture it. The chaos capital of the world." Twilight Sparkle: "I can't picture anything. It's too dark." Later, rediscovering the importance of friendship, while reading a letter written before, Twilight has a flashback to the 5 other ponies in the group bathing, with the zebra Zecora in attendance outside the bath. In "Sisterhooves Social" (season 2 episode 5) Applejack tackles her little sister Apple Bloom and they bathe in grape juice. In "Baby Cakes" (season 2 episode 13) Pinkie Pie is babysitting twins Pound Cake (male, brown hair) and Pumpkin Cake (female, orange hair) the children of Carrot Cake (father) and Cup/Dazzle Cake (mother). They do not want to have a bath so Pinkie chases them around and Forced Bathing occurs. She gives them a Rubber Duck and a Sponge, which may be a reference to SpongeBobSquarePants. In "Hearts and Hooves Day" (season 2 episode 17) an unnamed stallion is pictured. Apple Bloom says "Too clean." In "A Friend in Deed" (season 2 episode 18) Cranky Doodle Donkey is bathed at a spa at Pinkie's request. In "One Bad Apple" (season 3 episode 4) after unintentionally taking a Mud Bath and getting filthy trying to save Babs, the three Cutie Mark Crusaders (pegasus Scootaloo, Rarity's unicorn little sister Sweetie Belle, and Applejack's earth pony little sister Apple Bloom) all use a Barrel Bathtub to get cleaned up. They wear towels to get dry as they make up with Babs Seed (Bloom's cousin) over their previous fight. Bloom: "Maybe we'll get our cutie marks in stupidest ideas of all time." Babs: "You pushed me out just when the float was about to head into the lake!" Scootaloo: "Except... we were the reason it was headed into the lake." Belle: "We booby trapped the float." Bloom: "Y'see Babs, we were tryin' to get you back for bein' a big bully..."
Scootaloo: "But then Applejack told us about how you were being bullied back in Manehattan." Belle: "And we figured out you were just doing it to avoid getting picked on in Ponyville. But, by then..."
Belle: "...we were the ones being bullies!" Belle: "why does life have to be so ironic?!" Bloom: "Guess what we're trying to say is..."
Applejack: Thanks for walkin' me home, Spike, that was mighty kind of you. But now I have chores that need tendin' to, so see you later. Spike: What chores? I'll do them! Spike: It's the least I can do! You saved my life! I need to repay the favor. Applejack: Shoot, Spike, that's what friends do for each other. You don't need to repay the favor. Applejack: Sugar, it's okay, it's not necessary. Spike: Applejack, you don't understand! This is something I really need to do! Spike: Great! What should I do? Applejack: Uh... Apple Bloom's over yonder givin' little Piggington a bath. I was gonna lend her a hoof, but maybe you could lend her one instead. Spike: Applejack said I could help you! Apple Bloom: Great! I could use all the help I can get! Spike: Heh, wait 'til Applejack sees how you sparkle! Applejack: Good job, you two. In "Just for Sidekicks" (season 3 episode 11) when Spike dumps the Mane 6's pets off at the CMC's place, when he returns to check on them, Pinkie Pie's pet alligator Gummy is taking a Bubble Bath in (and a bite out of) their Clawfoot Bathtub. As he jumps vertically in and out of the bubbles, Fluttershy's pet bunny Angel is doing some Rim Sitting, hopping back and forth, although there is no indication that Angel took a bath too. In "Games Ponies Play" (season 3 episode 12) Princess Cadance points out a Mud Bath (although it looks more like Green Bathwater) to Rarity. Pinkie Pie then gets excited and dives into it. Princess Cadance: "That over there is a crystal mud bath, which relaxes your body and rejuvenates your coat." Cadance: "Now, I realize it can be kind of strange to climb into mud, but if you'll just give it a chance, I'm sure–"
Pinkie: *laughing* "Ahh, so relaxing!" In "Magical Mystery Cure" (season 3 episode 13) and the third season finale, Twilight Sparkle makes a reference to the bathing habits Spike picked up in #Episode 25, indicating that for the 40 episodes since then, he has been taking 7 hour bubble baths religiously to try and impress Rarity. Twilight Sparkle: This is bad. This is very, very bad. Spike: What's going on? Why is this happening?! Twilight Sparkle: Last night when you were taking one of your seven-hour bubble baths, I got a special delivery from the princess. In "Three's a Crowd" (season 4 episode 11) during his "Glass of Water" song, Discord takes a Milk Bath with a cow and then pulls a cord and leans back and has normal water shower at the end. "And then I'll need some nice warm milk"
In "Filli Vanilli" (season 4 episode 14) Fluttershy's friends find her alone in her cottage, with her voice back to normal after her offscreen bath. She is seen with Towel on Head, covering her pink hair. Preceding this scene, the need to bathe to rid herself of the altered voice was mentioned by Rarity ("Now you can bathe in the poison joke antidote and sound like your lovely self again.") Steam is seen coming from the door Fluttershy exits from, indicating that the antidote bath she took was a hot one. Pinkie Pie: "That was totally unbelievable!" "I mean, the curtain came up and there you were, singing in front of everypony!" "And you know, I don't think anypony was jealous,"
"'cause there certainly wasn't an angry mob!" "But it must have been horrible standing there on stage,"
"all eyes glued directly on you!" "It's like you were living your own personal worst nightmare!" Fluttershy running off crying while wearing her Towel, which is inexplicably absent when she is seen fleeing from the house in the next shot. "Foal Sitting 101" debuted 18 July 2016"
Pinkie Pie narrates "After feeding, bath time is a must. Sounds fun, right? Except that sometimes... there's crying." She is depicted as a servant giving Pound Cake and Pumpkin Cake a mixed bath. Manga Toriko · Beelzebub · To Love-Ru Darkness · Prison School · Shoujo x Shoujo x Shoujo · Umi no Misaki · Centaur no Nayami · Code Geass: Shikkoku no Renya · Fairy Tail · Champion Red Ichigo · Ben-To Zero: Road to Witch · High School DxD · Bullet the Wizard · Naruto · Medaka Box · Tadashii Seikyouiku. · Soul Eater Not! · Mahou Sensei Negima! · Nanatsu no Taizai · Akame ga Kill! · Ikumen datte Koishimasu. Ongoing Series Toriko · Mobile Suit Gundam AGE · Beelzebub · Yu-Gi-Oh! Zexal · Naruto Shippuden · Area no Kishi · Fairy Tail · Doraemon · Uchuu Kyoudai · Sket Dance · Hunter x Hunter · Pretty Rhythm: Dear My Future · Chousoku Henkei Gyrozetter · One Piece · Aikatsu!